I thought I had a lot going on during my pregnancy…until I interviewed this week’s podcast guest. Maggie MacArthur is an impressive lady, and quite the trooper for working 3 jobs (one of which was serving tables) while pregnant. Luckily, Maggie’s professional life looks drastically different following the birth of her son Keegan, as you’ll hear in this episode. Maggie talks about the many plates she was spinning during her pregnancy, her realization that she wasn’t meant to be a stay-at-home mom, and how her son’s orthopedic condition has helped her better relate to her clients’ families in Episode 36 of the Guitars & Granola Bars podcast. Be sure to check out the show notes page for more information about Maggie, along with links to the resources she mentions in the episode. This episode is sponsored by Music Teacher’s Helper, which is software for music teachers and therapists that helps manage your private music lesson studio and/or music therapy practice. I’ve used Music Teacher’s Helper every single day since 2011, and it is one of the best tools I have to keep my private practice running smoothly. Sign up here for a 30-day no risk trial. If you choose to sign up after the trial using my link, you’ll save 20% off your first month! I celebrated the first day of autumn yesterday but stopping at Starbucks for my first pumpkin spice latte (nonfat, no whip if you ever feel like bringing me a present, ha!) of the season. It was the perfect midday pick-me-up as I did some planning before my first client arrived. It’s already been a whirlwind of a month at Music Therapy Connections, and there are no signs of slowing down in the coming weeks. As our current session of groups and classes wraps up, we are already putting together curricula for the next one — and offering even more day/time options since we maxed out this time around. Just last week we joined our local Chamber of Commerce, so we’re really excited about connecting with other local business owners and taking advantage of membership opportunities. One of those is an official ribbon-cutting ceremony, which is scheduled for October 9. We hosted a small open house in August for our current families, but we’ll be inviting the public to check out the new facility at this event. We’ve been so fortunate to see our clientele grow every week and see first-hand the impact we’re making on our community through music therapy, lessons, and classes. It’s an exciting time as a business owner, but even more so as a music therapist. I’m looking forward to seeing how this season continues to unfold not only for us, but also for our students and clients as they progress each week. I hope autumn is off to a wonderful start for you, too (and if you need a little musical inspiration, check out my fall song pack!). Happy first day of Fall! I’m not sure how we got to this point in the year already, but here we are…so we might as well sing about it. Many of my music therapy sessions, early childhood classes, and groups revolve around themes, so we’ll be doing plenty of singing about all things FALL over the next few weeks. 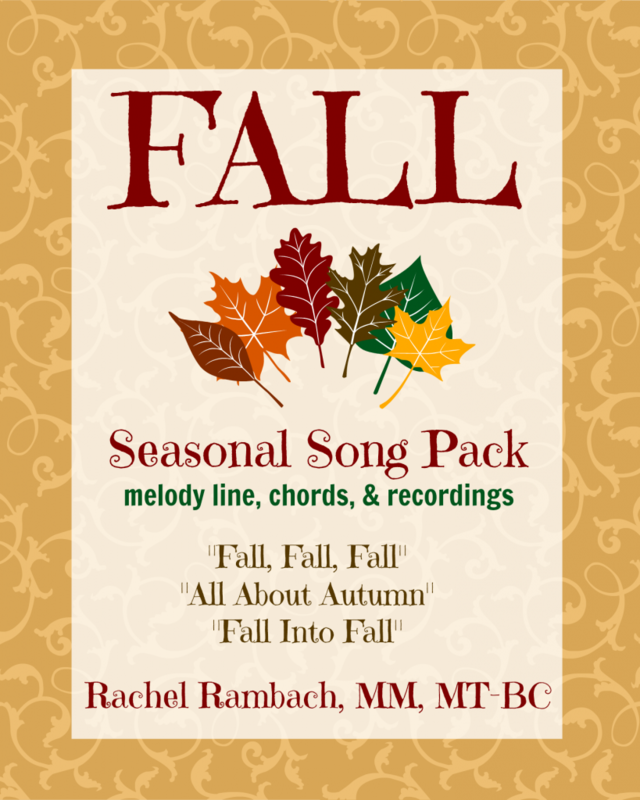 Since I know many of you will, too, I created a seasonal song pack comprised of 3 songs all about Fall. The pack includes the song recordings as well as a PDF songbook with melody line, lyrics, and chords. I chose the 3 songs that I rotate the MOST throughout this season; you can sing about Fall week after week while still offering some variety. This snackable pack is just $5, so add it to your Fall repertoire today. Those of you who already own one of these will never believe that this is the NEWEST addition to our collection of movement props. We have just about everything else (including most of what is available from our friends at Bear Paw Creek) but for some reason, a parachute didn’t make it into our hands until just a few months ago. 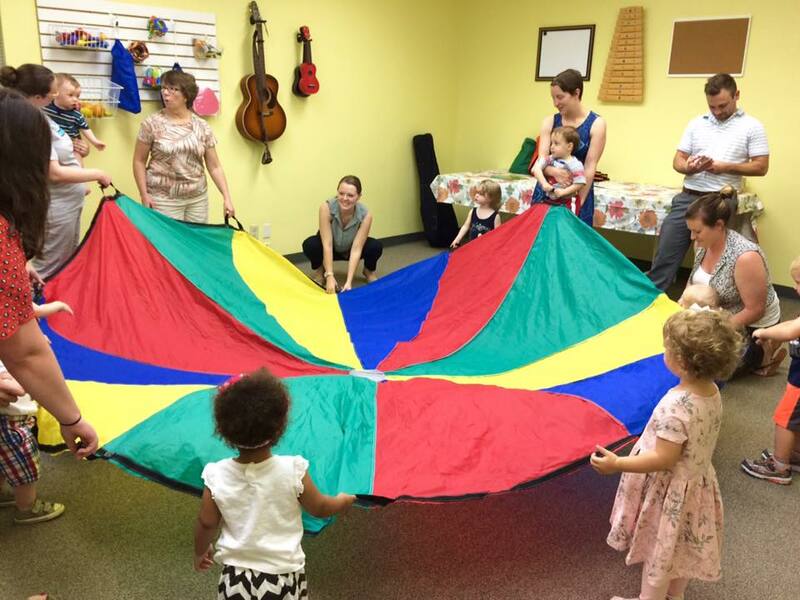 We’ve been having a blast using our parachute in the current session of our early childhood classes, and it’s a huge hit with all the kiddos. Most of them are getting used to holding the handles, but there are always a few who would rather stand underneath or right on top of the parachute. Needless to say, we are just as entertained as the children every time it comes out. There are lots of songs that lend themselves to the parachute, like “Ring Around the Rosy” and “Pop Goes the Weasel”, and it has also given me an opportunity to write some new ones. Can’t wait to share those with you soon! As often as we’ve been using this fun prop, we need to keep it fresh with a variety of material. What are some of your favorite parachute tunes and activities? Interviewing this week’s podcast guest was actually the second time in the same week that the two of us had an in-depth conversation. I first connected with Catherine Hershey a few days earlier when she interviewed me for her music therapy blog, and I enjoyed talking to her so much that I immediately invited her to be on the podcast. Little did I know just how fascinating Catherine’s music therapy and motherhood journey has been so far. Wait until you hear about her whirlwind experience from the start of internship through the birth of her son. Catherine talks about completing her internship in NYC while pregnant, how starting her blog was a turning point in her postpartum year, and the unique opportunity she has to design her ideal music therapy career in Episode 35 of the Guitars & Granola Bars podcast. Be sure to check out the show notes page for more information about Catherine, along with links to the resources she mentions in the episode.